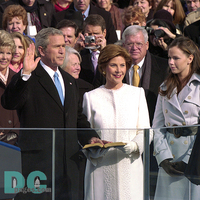 1 Each time a new president is elected in the United States, a special day is planned. This day is called Inauguration Day. This is the day when the newly elected president officially takes office and takes on the duties as the new president. 2 The day is recorded for history. Presidents may choose to honor traditions from years past. Some add their own touches. Many of the Inauguration Day traditions began with George Washington. Not all presidents keep the traditions that he started. Some start new traditions based upon the times in which they were elected. 3 Many begin their Inauguration Day with a worship service. The president-elect and his family may choose to attend a religious service in the morning. This tradition began in 1933. Franklin Roosevelt attended a service at a church near the White House. Since then almost every president has also attended a morning service.